For the Jewish community of northern Italy, frisinsal – or Pharaoh’s wheel is a very significant dish. Anne Shooter’s version uses leftover roast chicken, too. She serves it in a round dish to symbolise the wheels of Pharaoh’s chariots. Preheat the oven to 170°C/Gas 3 and grease a round shallow casserole dish, about 28cm in diameter. A lasagne-style, rectangular oven dish, about 35 x 25cm would also be perfect, despite it being less wheel-like! Roll the sausage meat into 16 small balls; if using sausages you’ll need to squeeze them out of their casings first. Add 1 tablespoon of oil to a frying pan and fry the meatballs over a medium heat for a few minutes to brown them. Add the pine nuts, flaked almonds, rosemary and shredded chicken. Meanwhile, bring a large pan of salted water to the boil and cook the fresh tagliatelle for just a couple of minutes, keeping it al dente. Drain the pasta and toss it in any pan juices you have left over from when you roasted the chicken, or 4 tablespoons of olive oil. Season with salt and pepper. Place half the pasta in the greased oven dish. Place the sausage meatballs on top, along with the pine nuts, almonds, rosemary, shredded chicken and the plumped sultanas. 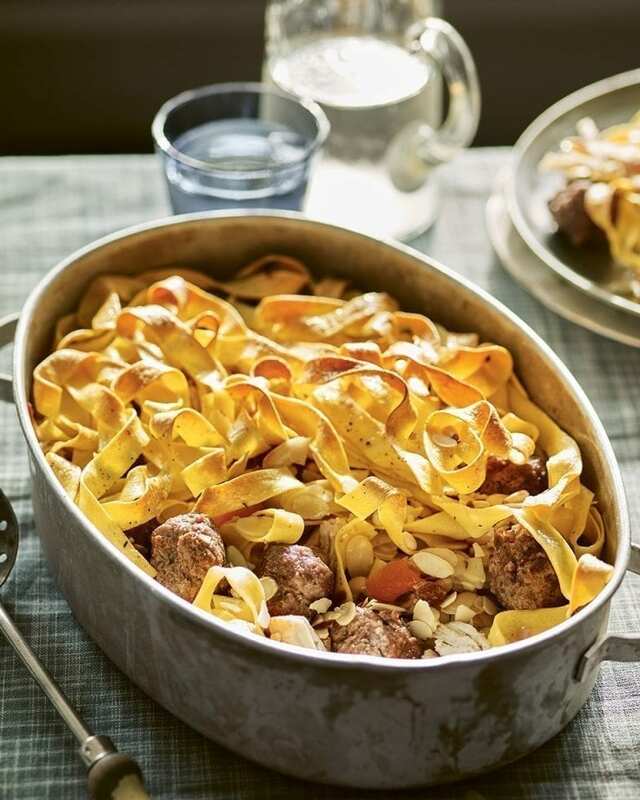 Cover with the remaining tagliatelle. Place in the oven and bake for 30 minutes, or until everything is hot and the pasta has started to go a little crispy on top. Serve immediately. This recipe is from Anne Shooter’s book Cherish (£28, Headline).